I wanted to put together a quick post mid-AEC to highlight a new (and for many, invisible) dimension to this year’s conference. For those of you attending the NSGC Annual Education Conference in Boston this week, you’re likely keeping busy hopping between talks, committee meetings, networking functions and catching up with old friends and colleagues. You’re listening to experts in our field discuss new and relevant topics in our profession, and exchanging your thoughts on the lectures with the person you are sitting with. If you aren’t able to attend the AEC this year, you may have perused the preliminary program and made note of the topics, but that may be the extent of your connection to the AEC content. You can also access a live stream of a combination of the two twitter feeds on The GenoScape blog. This has benefit not only for non-attendees. As an attendee, Twitter has enhanced the conference experience for me immensely. I love being able to “listen” to others reaction to the same material I am processing. It is like being able to read someone’s conference notes over their shoulder. I’m always surprised by the difference in what others take away from the same information that I am listening to. And I like being able to silently interact with other conference goers (usually strangers) in order to gain access to another perspective. Laura Hercher (@laurahercher) and I (@alliejanson and @GenoScapeGC) are both at the conference and actively tweeting throughout the day. We are also occasionally tweeting from the @theDNAExchange account. 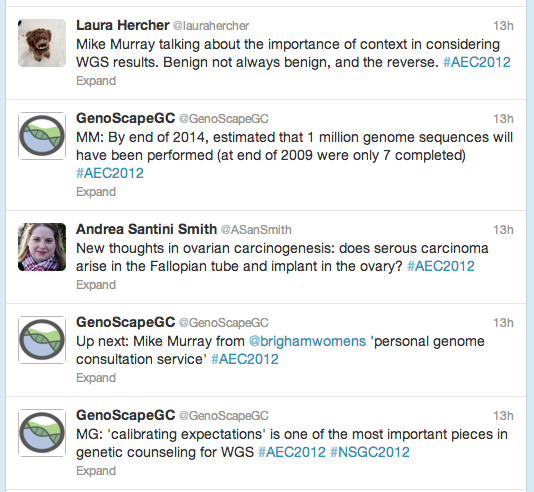 There are a numer of other notable GC tweeters here as well: @ASanSmith, @GeneticCouns and @dcheatherc. Whether you’re attending the conference or tuning in from afar, I encourage you to join in!